I love books about the mysteries, myths and magic of London (there's an alliteration for you). I've got quite a collection and I frequently use them to get ideas for places to visit and for things to blog about. Sometimes I look at my bulging bookcases and wonder which books I would keep and which would go if I had to downsize. One of my most treasured books about London's legendary past is one of the first I acquired, The Aquarian Guide to Legendary London. It was published over 25 years ago by the Aquarian Press and is a collection of essays edited by John Matthews with Chesca Potter, the same artist who created the Greenwood Tarot. Today, a new book about London edited by John Matthews is published. It is called The Secret Lore of London and was co-edited by Caroline Wise, author of Finding Elen, the Quest for Elen of the Ways, with a foreword by Iain Sinclair, author of books including Lud Heat and London Orbital. I was lucky enough to get sent a preview copy and I promised to post a review on the day the book was launched. London is a city immersed in ancient history, whose foundations date back thousands of years; a city containing layer upon layer of story ranging from the historical to the mythical... Material includes an exploration of the witches who once openly plied their trade without retribution, an indepth account of the Beating of the Bounds, one of oldest surviving traditions of London, as well as the mysterious Celtic legend describing the burial of the head of God Bran beneath the White Hill – now the site of the Tower of London. The book also includes a useful Gazetteer section, a practical guide to the many sites and legends mentioned and details of how to explore them at first hand. I've really enjoyed reading The Secret Lore of London. 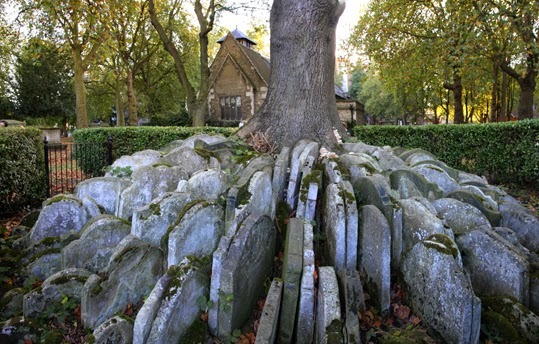 It is full of fascinating details about many of my own favourite parts of London, including Bunhill Fields where William Blake is buried and St Pancras Old Church where you can find the Hardy Tree. It covers famous places such as the Tower of London, but also many hidden gems including the London Stone, Postman's Park and Camlet Moat. While I was reading The Secret Lore of London, I did notice similarities with The Aquarian Guide, so I asked Ruby Mitchell, publicity manager at Hodder and Stoughton, what the connection was. She explained that the new book contains some essays from the earlier one, but its gazetteer has been fully updated and also some of the stories from London’s past. I have to say that I am delighted that the best material from The Aquarian Guide has been given a new lease of life, letting new readers enjoy a collection of wonderful essays that have been long out of print. The new material makes the book even better - and the title and cover are a lot more up to date too! Back to my question about what would stay and what would go if I had to downsize my book collection. Well, The Secret Lore of London is definitely a keeper. 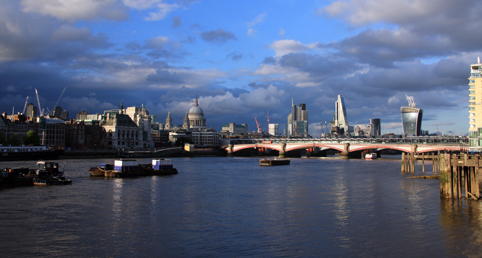 The photos of London sites are by me and show a view of the Thames, the Hardy Tree and the London Stone.